Equity Value and Enterprise Value are technical topics that almost every would-be investment banker gets wrong. So much so, that if I were giving a rigorous technical test to IB/PE interview candidates, I would base 100% of my questions on these two concepts. Because there are so many terrible explanations that questions based on Equity Value and Enterprise Value are a great way for investment banks to find the best candidates. Both of these terms relate to a company’s value. It’s the same formula used for Terminal Value in a Discounted Cash Flow (DCF) Analysis; in real life, we have to create a DCF instead of using this single formula because a company’s Growth Rate, Discount Rate, and Cash Flow change over time. A company with higher Cash Flow is worth more than one with lower Cash Flow. A company with higher Cash Flow Growth is also worth more. And a company is also worth more if the Discount Rate is lower, i.e. you are targeting lower returns. For simple, back-of-the-envelope calculations, this formula is a good way to estimate the value of an asset or company. But past a certain point, you must be more specific about what “Company Value” means. Does it refer to what the market as a whole believes a company is worth? Or does it refer to our opinion of what the company is worth? Does “Company Value” include all the company’s Assets or just those related to its core business? Does “Company Value” mean “value to all investors,” or just to certain investors? Current Value: What “the market as a whole” believes the company is worth. If the company is public, its share price reflects this amount. If the company is private, silly venture capitalists pouring money into a Ponzi scheme (Uber) reflect this amount. Implied Value: What you believe the company is worth. This figure reflects your view of the company’s Cash Flow, Discount Rate, and Cash Flow Growth Rate based on your expectations. Equity Value Definition: The value of ALL the company’s Assets, but only to EQUITY INVESTORS (common shareholders). 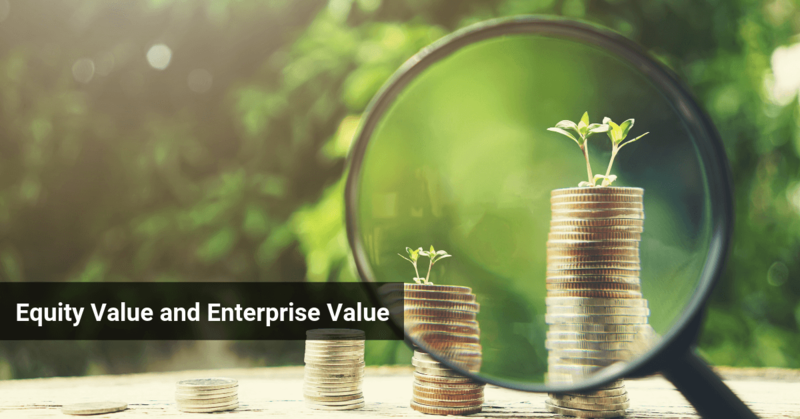 Enterprise Value Definition: The value of only the company’s core-business Assets, but to ALL INVESTORS (Equity, Debt, Preferred, and possibly others). You can calculate a single company’s Current Equity Value, Current Enterprise Value, Implied Equity Value, and Implied Enterprise Value. They each mean something slightly different, and you’ll almost always calculate all of them when valuing or modeling a company. Therefore, you subtract non-core-business Assets (Cash, Investments, Associate Companies, and anything else unrelated to the company’s operations) as the first step in this move. Therefore, you add Liability & Equity line items that represent other investor groups as the second step in this move. The most common items are Debt, Preferred Stock, and Noncontrolling Interests, but there are others, such as Unfunded Pensions, as well. To move from Equity Value to Enterprise Value, you subtract the non-core-business Assets: Cash, Short-Term Investments, and Long-Term Investments. Neither Equity Value nor Enterprise Value is “correct”; they’re just different. A company issues $500 in Dividends. What happens to its Equity Value and Enterprise Value? A company raises $1,000 of Debt to repurchase Stock. What happens to its Equity Value and Enterprise Value? A company repurchases $700 of Stock using Cash. What happens to its Equity Value and Enterprise Value? The worst way to answer these questions is to use the standard formula for Enterprise Value: Equity Value – Cash/Investments + Debt + Preferred Stock + Noncontrolling Interests. That formula will make it very confusing because you have to think about whether or not each item changes. Step 1: What is responsible for this change? Something related to the company’s Common Equity (a stock issuance, repurchase, dividends, etc. ), or something else? If the answer is “something related to the company’s Common Equity,” then Equity Value will change. If the answer is “something else,” then Equity Value will not change. Step 2: Does a core-business Asset change? If so, Enterprise Value will change. If not, Enterprise Value will not change. Example #1: A company issues $200 of common shares to acquire $200 in PP&E. Step 1: A common stock issuance is responsible for this increase in PP&E. Therefore, Equity Value increases by $200. Step 2: PP&E is a core-business Asset. Therefore, Enterprise Value increases by $200. Example #2: A company uses $100 of Cash to repay $100 in Debt. Step 1: A common stock issuance was not responsible for this change. It involved Cash and Debt, not stock. Therefore, Equity Value stays the same. Step 2: Cash is not a core-business Asset. Therefore, Enterprise Value stays the same. Example #3: A company issues $200 of common shares. It acquires another company for $100 and leaves $100 in Cash on its Balance Sheet. Step 1: A common stock issuance was responsible for this change. Therefore, Equity Value increases by $200. Step 2: The other company is a core-business Asset, but Cash is not. Therefore, Enterprise Value increases by $100. Example 1: The company wins a major contract with a new customer, boosting its expected future Revenue and, therefore, its future Cash Flow. Example 2: The company closes down an unprofitable division, boosting its margins and its expected future Cash Flow. Example 3: The company negotiates a better supplier contract, boosting its margins and its expected future Cash Flow. They change the company’s expected future cash flow from its core business. They do NOT change the cash flow just for one group of investors. All the investors are affected. Only changes to a company’s core business affect its Enterprise Value, but both financial and operational changes affect its Equity Value. In the long term, that PP&E will generate additional cash flow for the company’s core business. This additional cash flow will be available to all the investors in the company. For this rule, it’s helpful to think about “who gets paid” at each step along a company’s Income Statement. Initially, a company’s Revenue, Gross Profit, and Operating Income are available to all investors in the company. When those increase, everyone benefits. For example, higher Revenue makes it easier for the company to pay interest on Debt, Preferred Dividends, and Common Dividends. If a metric is before Interest Expense and Preferred Dividends have been subtracted, then you pair it with Enterprise Value. If a metric is after Interest Expense and Preferred Dividends have been subtracted, then you pair it with Equity Value. Common metrics that pair with Enterprise Value include Revenue, Operating Income or EBIT, NOPAT, EBITDA, and Free Cash Flow to Firm (i.e., recurring cash flow available to all investors). Common metrics that pair with Equity Value include Net Income or Net Income to Common, Free Cash Flow, and Free Cash Flow to Equity. Everything above represents a theoretical view of Enterprise Value: That it’s truly “capital structure-neutral,” and that only changes to a company’s core business affect it. This view breaks down in real life because a company’s capital structure does affect its value because of taxes, bankruptcy risk, and agency costs. For example, at first, additional Debt helps a company Debt is cheaper than Equity and Preferred Stock (due to the tax-deductible interest, among other factors). But Debt starts hurting the company past a certain point because the bankruptcy risk climbs to a much higher level, and there’s a higher chance of conflict between the different investor groups (“agency costs”). This concept applies more to Implied Enterprise Value than Current Enterprise Value. If a company raises more Debt, its Current Enterprise Value will probably not change overnight. But if it is expected to have more Debt permanently, its Current Enterprise Value will start to change. The bottom line is that Enterprise Value is not truly “capital structure-neutral,” as some sources claim. As a result, there are disagreements over how to treat certain, more advanced items that go into the calculation. My advice is to focus on the basic items that everyone can agree on – Cash, Debt, Preferred Stock, and so on – as well as common transactions that affect those items. So, how well do you understand these concepts? Explain why you add Unfunded Pensions when moving from Equity Value to Enterprise Value. Also, explain the tax treatment. Explain INTUITIVELY how Implied Enterprise Value might be negative. Your answer should be 1-2 sentences, and it should not include any formulas or numbers. A CEO picks up $200 in Cash on the street and adds it to the company’s bank account. Explain what happens to Equity Value and Enterprise Value using the “2-step rule” for changes. Hint: Think about how you would record this transaction on all three financial statements. A company generates $100 in Net Income. Does its Enterprise Value change? If so, what is the intuition behind it? If not, what would cause it to change? Hi Brian, great article. What does debt free cash free purchase price mean? Is this simply the equity purchase price? It means the effective purchase price is closer to the Purchase Enterprise Value because the target must use its Cash to repay its Debt before the deal closes, and the final Cash and Debt balances must both be 0 when the deal closes. As you said the cash and debt balances must be 0 when deal closes. Is this possible in all deals, for example cash is $100 and debt $80, in this case the after payment of debts surplus of $20 shall be lying there in the balance sheet. Or is there any other perspective to this? If there is excess cash remaining, it goes to the buyer and is still removed from the balance sheet before the deal closes. Thanks for this very good article. I am a client of BIWS and strongly recommend your courses to everyone with an interest in financial modeling. Does this mean that the issuance of additional shares for cash which is then used to acquire operating assets that ultimately boost EBIT and FCF (and, consequently, EV) is not necessarily dilutive? Thanks in advance. You can’t determine EPS accretion/dilution based on how Equity Value and Enterprise Value change. You have to look at how the company’s revenue, expenses, Net Income, and share count change, and so you would need more information to answer that question. If the acquired operating assets generate Additional Net Income such that Total Net Income increases by a greater percentage than the share count, it could easily be accretive. If not, it will probably be dilutive. Or it might be dilutive near term and accretive longer term. Have a question related to EV & firm value that is not really discussed in this article, however it will mean a lot to me if I can get an answer to it! While I understand why enterprise value (firm value less cash) and firm value are important to equity investors with controlling interests (m&a), I don’t understand why EV or value of the firm is equated to the value of the controlling interest. For example, why is the present value of FCFF used to value a controlling interest? why not FCFE instead? Another example: why are enterprise value multiples used to value controlling interests, not price multiples? I understand that a unit of controlling interest is valued higher than a unit of minority interest (equivalent to share price reflected in stock market) due to control premium & synergy considerations. However, isn’t a controlling investor STILL an EQUITY investor? why is the value of his controlling interest often equated to the value of the firm (equity + debt)? I don’t really understand what you are asking about, sorry. If you are a customer, feel free to ask/explain more detailed technical questions like this inside the site. An example, screenshot, or numbers would be helpful. 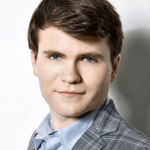 “And a company is also worth more if the Discount Rate is lower, i.e. you are targeting lower returns.” I found this confusing. The Discount rate is basically risk when doing DCF. Now if I wanted to use a lower discount rate, that would be because I think the investment is less risky. Why would the value of a company be worth more if I am targeting lower returns? Lower returns would increase the risk you would think”. Please correct me if I am wrong. “targeting lower returns” means that your other, similar options in the market have lower risk and lower potential returns. If your other options are worse, then the company you’re analyzing looks better by comparison. The Discount Rate is both the risk and the potential returns. Hi Brian. I am trying to get to enterprise value (and equity value) of a business that is planning significant investments in the next years, which are supposed to yield a certain return, so higher cashflows in further years (minus capex needed). They don’t have the funds for that, in their business plan they are showing an increase in group overdraft. In practice I am planning to buy a 50% share in that business (form a joint venture). How should I approach this – should I account for this potential in my DCF valuation? But if so, they could show anything in their business plan and boost the value – perhaps they can lend a further 100m and conquer the whole market or whatever. This might even be possible but should they be boosting the value as of today like this, even if DCF is the value of future cashflows? Another thing is they don’t even have enough funds by themselves to fund the replacement capex necessary to keep current sales. I am really confused as to what would be the definition of my enterprise value here (and equity value that will eventually be the basis for the final price – I can only deduct the net debt at the start of the JV, not future debt that they are projecting) and what should be my base case for valuation, logically speaking? Their full magical business plan? But then how is further indebtedness accounted for here, how should it affect EV/QV as of today and the price I should offer them for 50% stake? DCF comes out quite low actually with all of those investments, and negative in the first years, lowering my EV. Is this correct? Or should I be constructing a different scenario as my base case? The question you’re asking is beyond the scope of what we can answer for free in detail here. We typically only answer questions like that for coaching clients and customers of our courses (in which case, feel free to ask within the BIWS site). The short answer is that yes you need to factor in future capital spending and the resulting growth from it, but it shouldn’t continue into eternity, so it should ramp down over time, and you don’t factor in equity/debt funding into an Unlevered DCF at all, so this capital spending should just reduce the company’s Unlevered FCF. I would like to know if in case of a share capital increase, do we need to subtract that amount (or the PV of that amount) from the equity value? If so, then no, you actually add the amount raised to calculate Equity Value. Equity Value will increase and Enterprise Value will stay the same because Cash will offset the additional Equity. Why in general the Equity Value from FCFF (subtracting net debt) is different from the Equity Value from FCFE? Because different items go into the calculations, so they are not equivalent. As a simple example, think about the interest rate on the Debt: it directly affects FCFE but does not affect FCFF at all, except for maybe a very slight impact on the Discount Rate. You can tweak variables like that and get different results because the calculations are different. Your comments on adding certain Liability & Equity line items such as Debt, NCI and Unfunded Pensions to arrive at Enterprise Value piqued my curiosity. Question: How would you treat items on the L&E such as “Provision for defined benefit retirement obligations” and “Concession Liabilities”? Would you also add these items to the Equity Value in order to arrive at Enterprise Value as these are considered “Non-core operations”? You should add Unfunded Pensions when calculating Enterprise Value because they represent another investor group. “Provision for defined benefit retirement obligations” falls into this category. Concession Liabilities I’m not sure of because it depends on what goes into them, but if they are not interest-bearing liabilities, you probably don’t factor them in because they are operational items rather than financial ones. The Core vs. Non-Core distinction doesn’t matter on the L&E side… only whether or not something represents an investor group (i.e., a financial item such as Debt) or is just operational in nature (Accounts Payable, Deferred Revenue, etc.). Thanks Brian, hear you loud and clear! When we come to equity value from enterprise value. 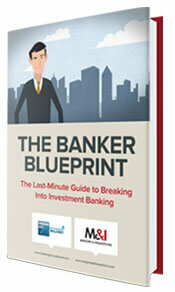 Do we take the current market value of debt and short term investment or just the book value. You should ideally use the market value if you can find it easily, but if not, the book value is usually fine because the book value and market value of debt and investments tend to be similar for healthy companies (there is more of a gap for distressed companies). if a company has invested ($25,000) in Public Companies Securities, and at the time of valuation if the value of those investments is ($50,000). In this case, should we add $50,000 while arriving at the equity value from enterprise value? 2) Answered in the comments because of negative cash flows in the future, wherein you would move to relative valuation. 3) Enterprise Value will remain unchanged but Equity Value will increase. In the balance sheet, reserves and cash will go up. In the income statement, non-operating income will increase. In cash flow statement, cash flow from financing will increase. 4) Depends on if increase in net income is through core business or non-core business. 3) Partially correct. Your walk-through on the statements is off. 4) No (you sort of have the idea, but you’re thinking about the wrong statement). I’d like to know if a company w/ high growth rate or margin, in general, has the numerator (EV) or the denominator (EBITDA) more increased. I thought that is good to have great margins and growth for the company`s value but, in the other hand, it can affect the EBITDA, reducing its multiple. So, which one is greater, EV or EBITDA given the high growth and margin? It’s impossible to answer that question without knowing the specific numbers and the discount rate. Going from 5% to 6% growth won’t change much, but 5% to 50% would obviously be a dramatic difference and would likely boost all its multiples, meaning its Enterprise Value would almost certainly increase by more. In that case (5% to 50%), possibly, would the impact be greater in the EV or EBITDA (numerator or denominator)? Why, in general, P/E multiple is higher than EV/EBITDA multiple, even for capital intensive companies? Because generally, a company’s Net Income is lower than its EBITDA by a bigger percentage than its Equity Value is lower than its Enterprise Value. Just think about a company with a 20% tax rate, minimal cash, and no debt or preferred stock: Equity Value and Enterprise Value will be almost the same, but the 20% tax rate alone means that Net Income will be at least 20% lower than EBITDA. And if you factor in D&A as well, Net Income might be 25% or 30% lower (or more… obviously it varies based on industry, but you get the point). Great Post! Just had a question regarding the enterprise value for a private company. How would you take into effect the FMV of the assets? Since they are recorded at book value and would be effectively report a much lower Enterprise value. You can’t calculate Current Enterprise Value based on market values for private companies. Only Implied Enterprise Value means something, and you have to calculate it with the usual valuation methods. Private companies do not have publicly listed/traded share prices, so that is the only option (unless the company has recently raised funding, but that only applies to startups in most cases). And why we don’t use the Cash Flow Statement instead of FCFE (the major differences)? No, you get the Implied Equity Value directly. Equity Value reflects all assets, both core and non-core, so you don’t need to add anything to it. FCFE should include cash flows from non-core assets as well (which is why it should start with Net Income… not Operating Income). The CFS includes non-recurring items and is often ridiculously long, so not practical to use in valuations. Why the majority of people are still calculating Equity Value in this way: Equity = EV – Debt + Cash, not considering other non operating assets and liablities (just the cash)? Because in most cases, the simpler formula works because many companies have minimal non-operating assets/liabilities (except for cash and debt). Hi Brian, thanks for the great article. 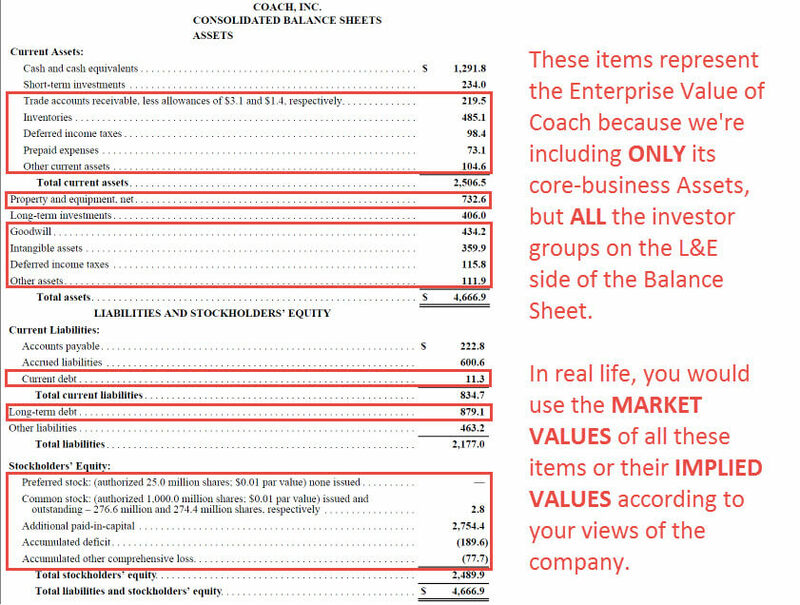 It really helped me understand enterprise value. I’m still a little confused with the concepts though. First of all, when moving from enterprise value to equity value, why do we only subtract interest-bearing debt but not all liabilities? For example, let’s say a company bought some machines and hasn’t paid in cash, making the company possess $100 worth of other payables. Although these payables are not interest-bearing debt, shouldn’t it be subtracted from the total firm value as it is something that’s not attributable to equity investors? Likewise, shouldn’t all liabilities be subtracted rather than only the interest-bearing debt? Also, this is a minor question but if a company has sold some machines and hasn’t been paid yet(classified as other receivables), should that be added to enterprise value when moving to equity value? I’m not sure if it’s really a non-operating asset that should be considered in this case. Because interest-bearing debt is related to the company’s finances, not its operations. Other liabilities such as accounts payable are operational in nature, so you do not subtract them. Regardless of how a company eventually decides to finance its purchase of these machines, accounts payable will be created as an intermediate step in the process. That is why it’s an operational item – it doesn’t depend on a specific type of financing. You typically subtract the net assets of discontinued operations when moving from Equity Value to Enterprise Value because they are considered non-core at that point. On your article, you mentioned that the equity value includes the value of core asset + non-core asset and EV only include the core assets, if that is the case, can I interpreted as any changes on the core asset on the balance sheet, would affect both EV and equity value? If that’s the case, under “Implication #1” – Step 1: why would you say that if the change is related to the company’s common equity, it would change the company’s equity value, if it is “something else”, then the equity value will not change? A company can use debt to purchase core-asset (say PP&E) which will affect the company’s core-asset value, and since Equity value = value of core-asset + non-core asset, then shouldn’t the company’s equity value change as well? You can’t say that because if the change was related to the company’s Debt (for example), it will affect only the company’s Enterprise Value. For Equity Value to change, an Asset must change and it must be *caused* by a change in the company’s shares (something the equity investors did). Using Debt to purchase PP&E will not affect the company’s Equity Value because the change is attributable to a different investor group (the Debt investors). Thanks Brian! Also, can I think about it this way, separate the process (in my example) into two isolated but subsequence process? first, change of debt cause cash to increase, which has no effect on the company’s equity (that’s why equity value doesn’t change on this step). Second, company use this cash to purchase core-asset, which change the company’s EV but not equity value. Would my thought process be correct this time? Thanks for the great article. I won’t how would the EV and Equity change, if the company raised 50% debt and 50% equity to purchase a $100 PP&E. I know that EV will go up by $100, because PP&E is a core asset, but would equity value go up by $100 as well? or up by $50? Equity Value will increase by $50 because the company only issues $50 of Equity to do the deal. What if? EV of of the Company is significantly lower than its Equity Value ? I have been referred a case, in that case Football Club Enterprise Value (EV) was assessed 3.9.2M To 6.7M Pounds whereas Equity Value was 56.2M Pounds due to bulk of cash received by the Football club was retained as Cash on the Balance Sheet on valuation date. If this is the case where Enterprise Value < Equity Value so what would be the right purchase price for the Buyer of business. I can’t say without seeing the details of that deal, but the effective purchase price is usually closer to Enterprise Value, though it’s still different because of the exact treatment of cash/debt, transaction fees, and so on. The article is quite good, thanks!. However, I still have a doubt. For a non public company, a private investor that would buy the whole company it would pay the enterprise value and if it bought part of the company it would be consider the equity value or in both cases it would be the equity value that the investor should consider?. a minority stake deal will likely be based on something closer to the company’s Purchase Equity Value. how do you calculate purchase enterprise value in a merger model? The normal way… except increase the target’s Equity Value by (1 + Purchase Premium) and then add/subtract the normal items. You write, that implied Equity value could be negative, because it is just derived from EV and everything could happen here. But as far, as I see, Equity value could be negative, if Net Debt (assuming there is not any other non-operating assets or claims) is more than Enterpsie value. And I think, that it is impossible, because in this case Net Debt will be valued at discount, since only part of Net Debt will be guaranteed by the value of business. So in this case market value of debt will be equal to Enterpsie value and implied Equity value will be zero. Another case, that equity value could be negative, if we derive it through FCFE model and we have negative terminal value. But is it applicable to use DCF here? May be we should use liquidation value method and in this case equity value may occur to be positive? Could you please write me, what are the flaws of my suggestions, and if everything is right, what is the particular case, when Equity value could be negative? Thank you very much. I think you’re over-thinking this concept. Implied Equity Value (or Implied Enterprise Value) could be negative if the company generates negative cash flow and it never turns positive in the future (e.g., doomsday scenario for Uber). In that case, the company is worth $0 today and it will require additional contributions from you, the investor, to continue running. That’s why a company could be worth a negative amount – not only is it worth nothing, but it will actually cost you something to own in the future. Thank you for your response, I see your point. And could you please elaborate on using the liquidation value method in case of negative cash flows? Is DCF still applicable to use in case of negative cash flows going to infinity? Yes you can still use a DCF, but in that scenario, a Liquidation Valuation would be more appropriate, as a company isn’t worth much if it has negative cash flows forever. I must say that you brilliantly explained this way better than my university institution have ever managed to do (especially the MM theorem part). I guess sometimes a less academic approach to explain complex problems is good for understanding the whole picture! So, in a DCF calculation, using levered cash flow returns equity value and unlevered cash flow returns enterprise value? Assuming that’s correct, then if you subtracted debt from the enterprise value you’d get to equity value and in the equity value scenario you don’t need to subtract debt because that has already been factored in? In terms of the fourth question at the end, would the answer be the unchanged for enterprise value? Since the caah increased from net income will be cancelled out by concluding the cash. Yes, but there’s a more intuitive explanation for why Enterprise Value remains unchanged. I´ve seen and heard of bankers here in Brazil moving from EV to Equity Value by also adding Net Working Capital (e.g. Inventory + Receivables – Payables), for the RETAIL sector. The theory is they se how much the current NWC exceeds its historical avarage and add that difference, but in practice they just add LTM Inv. and Receivables and subtract Payables. This happened both at a buldge bracket I did an internship at and at a friend´s boutique. Am I wrong to assume this can´t be done, since you already factor in NWC in your future free cash flows when calculating Enterprise Value? Is this just creative accouting for boosting Valuation, which ironically can backfire if the NWC is negative? Or am I missing something here? That seems very questionable to me. Working Capital is always related to the company’s operations, so it should not differ between Equity Value and Enterprise Value (and it’s already factored into Free Cash Flow used to calculate the implied version of either one). It seems like a way to artificially boost a company’s value with thin justification. I’ve encountered a company with interesting balance sheet items and this gives the calculation of EV some difficulties. The company is called Aimia Inc. (TSX:AIM). It’s the owner and operator of several frequent flyer loyalty programs (including Aeroplan in Canada). It has large amount of redemption liabilities on its balance sheet. My question is, should you include the redemption liability in its EV? What’s more confusing is that the company is required to hold cash reserves on the balance sheet against the redemption liabilities (but it only covers the small fraction of the redemption liability, the thinking is that the ongoing cash flow generated will cover most of the redemption liabilities). My question is, should I include this cash reserve in my net debt calculation? If this redemption liability is operational i.e. it is something that the company plans to pay out to customers in the future, it does not represent another investor group and should not be added when calculating Enterprise Value. You typically count all Cash as a non-core Asset and subtract it, even though that is not quite accurate since all companies need a minimum Cash balance to keep operating (and since some companies may keep reserves for various purposes). How would you overcome an issue of changing capital structure when trying to find WACC? Assume we are not provided with a target capital structure of the company. Is it correct to use industry average capital structure to find wacc? I don’t think it is appropriate to use current capital structure of the company, as it is changing and wacc is used to discount future cashflows with different capital structures. Change the Discount Rate each year and make it move closer to the one represented by the company’s long-term capital structure goal (e.g., 8% current Discount Rate to 10% target over 10 years – make it go up by 0.2% each year). If you don’t have the company’s target, take the median capital structure percentages from the comparables. No. See Key Rule #7 in the guide. 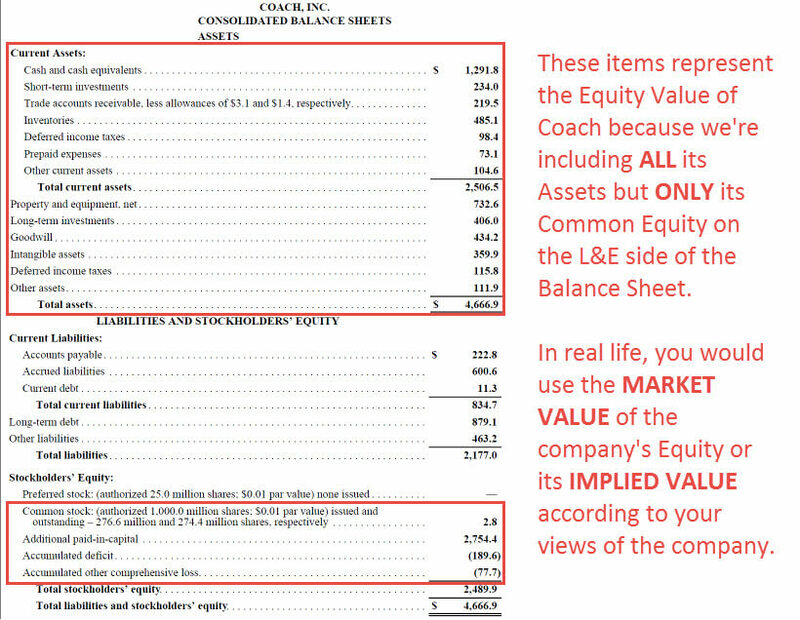 To move *from* Enterprise Value to Equity Value, you have to do the reverse and add non-core Assets and subtract items that represent other investor groups. So your equation is missing several terms. This is incorrect. You cannot have a (perpetual) growth rate larger than your required rate of return. As your growth rate approaches your req. rate, the implied value of your firm is infinite, but then flips negative as you grow faster than the rate required to invest? Of course not. This model works only for all r>g. Thanks for pointing that out. Yes, that was fixed in an earlier version. Somehow an older version was posted, so we just replaced it and changed that example. Worth to mention that when finding terminal value, growth rate used should be average predicted GDP growth rate of that country (in accordance to the mean reversion theory). In reality, most analysts use a combination of predicted inflation rates and predicted gdp growth rates to find g in the formula.